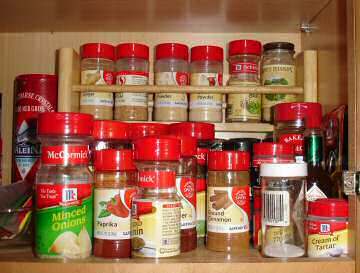 I am not a huge cook but I have a small spice rack that has overflowed. 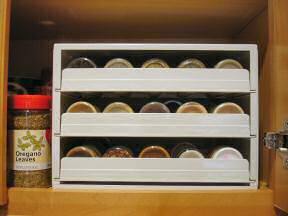 For quite some time now I’ve had the Spice Stack spice organizer on my wish list. It’s a storage unit where the spice bottles lie on their sides on a plastic shelf unit in which you slide out and swing down each shelf to select your spices and herbs. I finally got a Spice Stack for Christmas this year and I thought I’d show it to you along with some before and after photos of my spice storage situation. 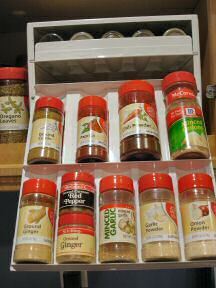 Here is a photo of my spice storage cabinet before. As you can see, the small rack in the back I was using had overflowed. Here are pictures of my spices in the new Spice Stack unit. All of my spices fit nicely into it with a little bit of room to spare. I was concerned about the larger sized containers fitting in this unit, but it ended up not being an issue. However, the super large sized spice container (see Oregano off to the side) didn’t fit, but that’s ok. I have not put the stickers with the names of the spices on the slide out shelves yet. I’m waiting to make sure everything is where I really want it to be. I’m very pleased with how this unit fits in my kitchen cabinet, with how many spices it holds, and with how easily the shelves slide in and out. I also like that it uses vertical space and looks neat and tidy.